As a go-to source for homeowners looking to create their dream homes, the American Society of Interior Designers (ASID) is committed to creating interiors that fit clients’ lifestyles while reflecting their individual personalities. 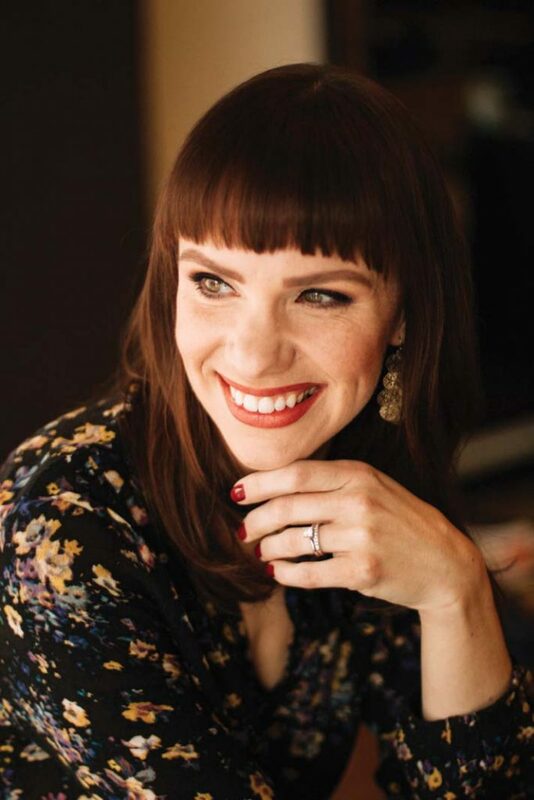 Every year, local designers submit their top projects to ASID’s Minnesota chapter for the chance to be recognized as one of the best by a panel of expert judges. Here, we take a look at the 20 designs awarded first place honors in 2018. Designer’s Note: A neutral palette of rich cream tones and soft greys was chosen to highlight the millwork and finishes of this condominium, while warm, gilded accents and high-gloss painted doors add contrast and anchor the space. 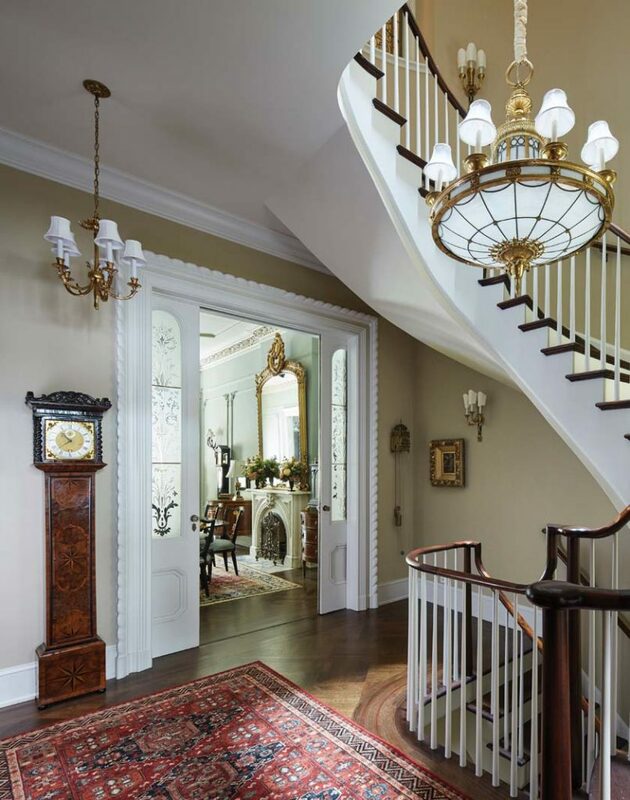 The designer added dimension through details including a beautiful coffered ceiling, beams in the kitchen, and wainscot and paneling throughout the home, and also focused on giving the client unique light fixtures such as crystal and gold chandeliers and sconces to provide a gentle glow. 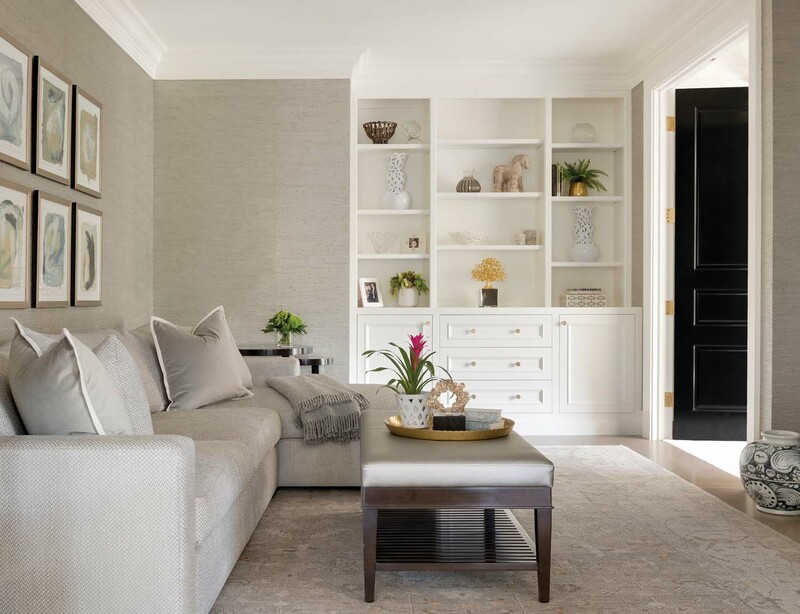 The condo’s den, pictured here, features a custom sectional, cabinets and trim painted in a subtle ivory, and a silk and wool rug and grass cloth in soft hues to add texture to the relaxing space. 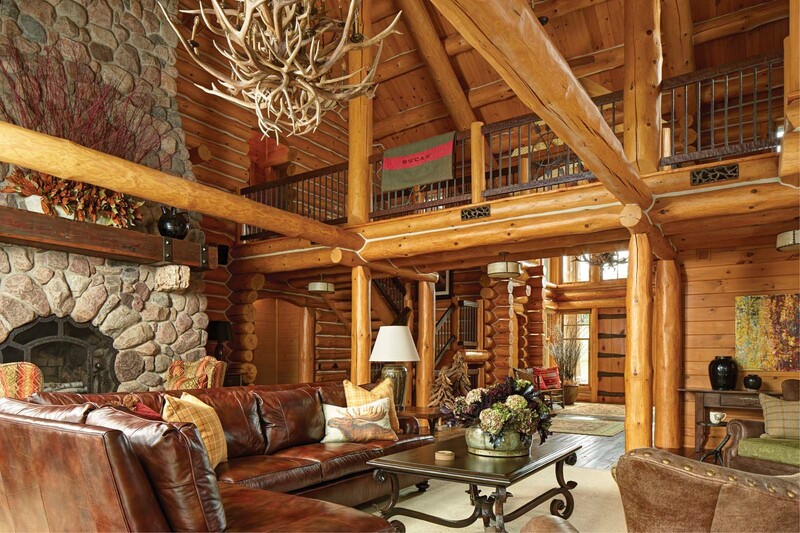 Designer’s Note: After sitting empty—and in a sorry state of disrepair—for nearly eight years, this log home was renewed as a gathering place for hunting weekends and special family occasions. Inspired by grand, circa-1920s Adirondack hunting camps, the designer reworked the interior floor plan, creating master suites and guest rooms and transforming a former game room into a ventilated cigar room complete with an antique bar. Pine logs on the walls and ceiling were buffed and polished, and doors were re-stained in dark walnut and old yellow pine floors replaced with dark reclaimed oak planks to create dynamic visual contrast. Designer’s Note: To restore this historic five-story townhouse in New York to its original glory, the designer worked with the local historic preservation commission to use 19th century photos as a basis to restore the building’s façade, cornice, and stoop. Inside, period details abound, such as elegant arches, antique chandeliers and sconces, well-worn Persian rugs, and plaster moldings recreated from the original molds, while modern conveniences were added in the form of an elevator, a penthouse, and a new sub-basement with a steam room, vault, and wine cellar. Designer’s Note: The clients of this lakeside lodge envisioned a cabin-style home that promised plenty of room and ample sleeping space for their growing family. 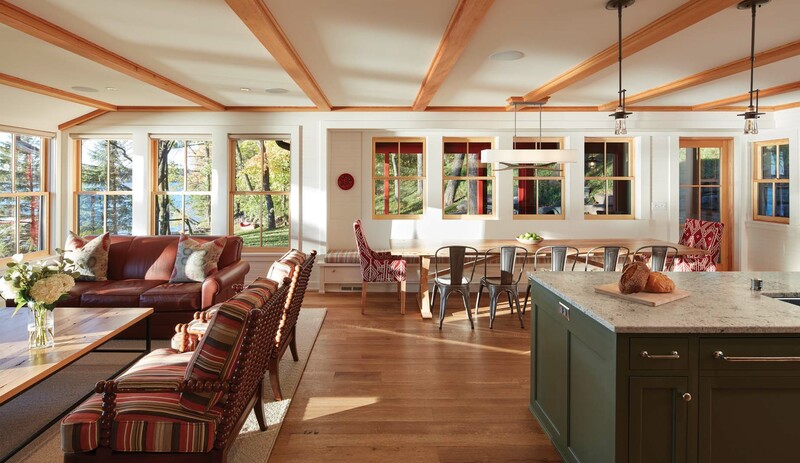 Branded with bright red detailing and a dark wash exterior, the tranquil lake retreat gives off a modern, fresh energy while the interior comes to life with beams of natural light, soft wood features, and cool, earthy tones. Small-scale rooms, generous windows, and a screened-in porch offer serene views of the woods, water, and natural rock bluff. Designer’s Note: It’s no secret St. Paul’s Summit Avenue is known for its gorgeous mansions and eye-catching exteriors, but the clients of this 1909 American traditional home desired an interior as equally jaw-dropping. 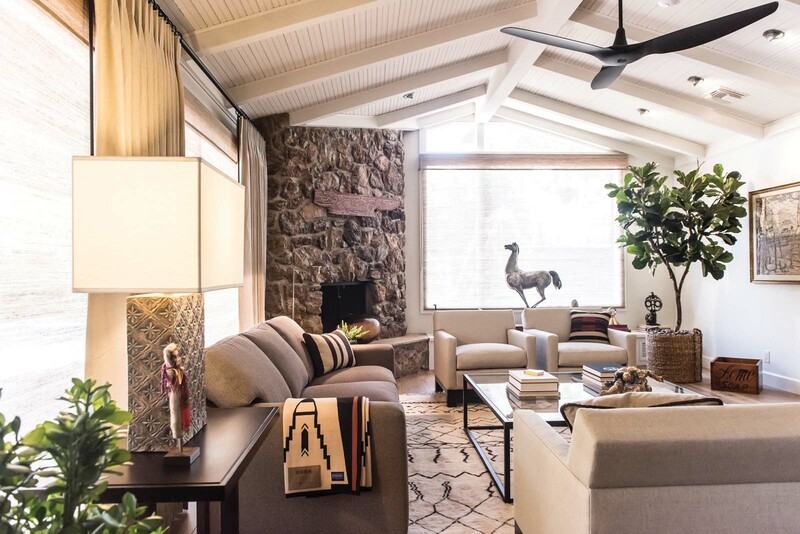 After opening up the floor plan to deliver a smoother and more consistent flow to the main level, the designer introduced natural materials and emphasized high-end details to embrace the home’s history. The remodel is tied together with a classic, yet contemporary aura—increased natural light gives off a fresh, airy aesthetic while white and blue tones usher in a crisp, modern feel. Designer’s Note: After moving to a sprawling two-story in the suburbs, the clients found their spacious kitchen felt disconnected from the rest of the home (as well as being much too traditional and gaudy for their modern-leaning tastes). 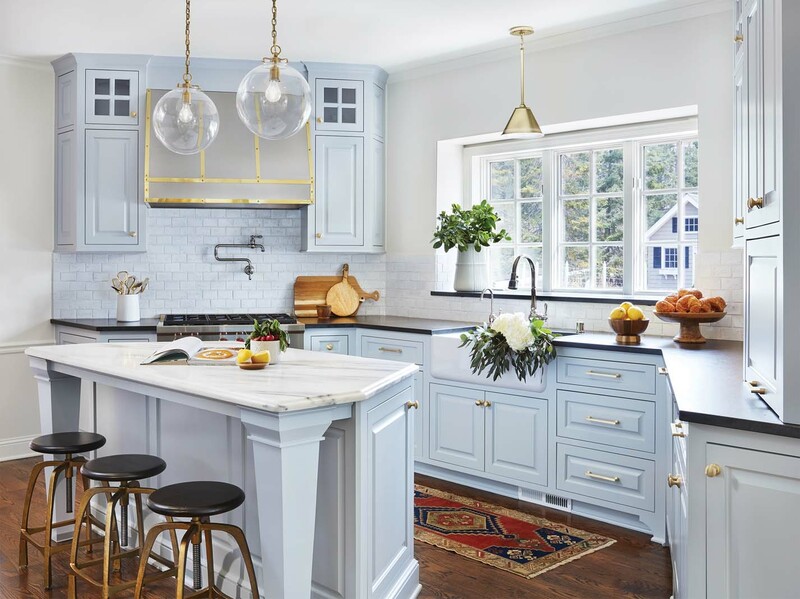 To solve these problems, the designer removed two existing walls to help connect the nearby dining and living spaces, and created a beautiful chef’s kitchen with a statement-making wall of built-in cabinets painted a bold navy blue. A sliding library ladder adds charm and function for hard-to-reach areas, while accents of warm brass and crisp white cabinets on the other side balance the room’s new personality. Designer’s Note: Specifically designed with the client’s love of entertaining (and nine grandchildren) in mind, the welcoming layout of this kitchen encourages intimate gatherings and lively conversation by providing easy access to both the formal and informal dining rooms. Special details abound, from the island’s curved corbel that complements the stove hood and cabinetry to the quaint tile backsplash inspired by the homeowner’s collection of blue-and-white dishes. Subtle notes of yellow complete the room’s classic French country look, while the simple-yet-sophisticated lantern chandeliers echo similar iron lighting used throughout the rest of the home. Designer’s Note: When the client moved back to St. Paul a few years ago, he found his childhood best friend’s home for sale. 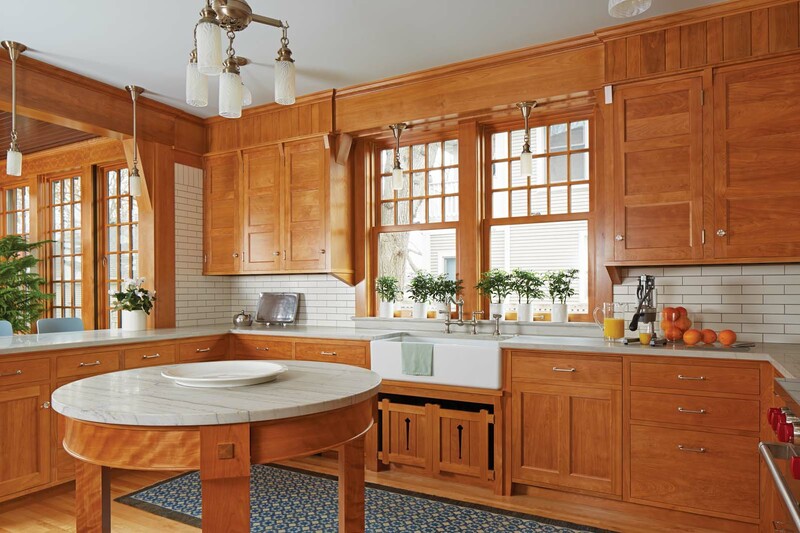 Though the Craftsman/Tudor-style home was still largely intact, a makeover of the 1970s kitchen was a major must. It was small, cramped, and dark, but rooted in tradition and class—a quality worth saving. The designer not only maintained the timeless detail, but also created an alluring effect with modern kitchen sensibilities, like a marble-covered roundtable and cabinets clad in natural wood. 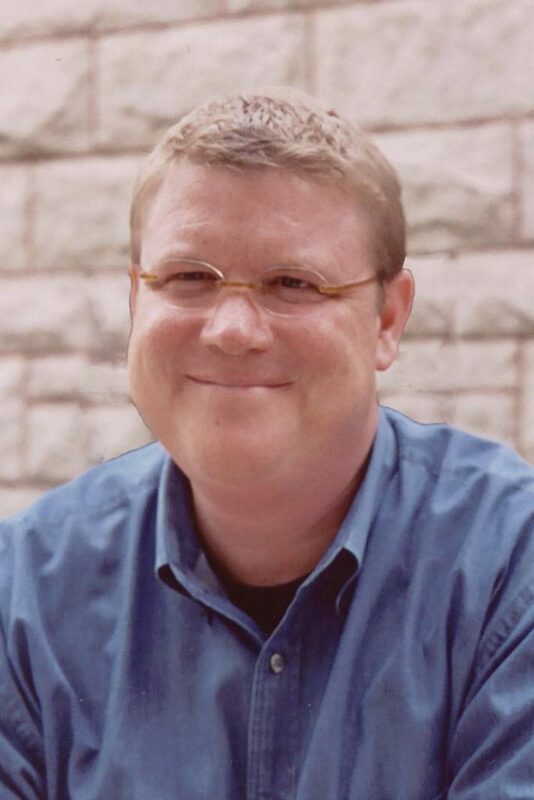 Designer’s Note: The need? A multi-purpose, family-focused spot perfect for breakfast, baking, and finishing a hefty load of homework. The solution? 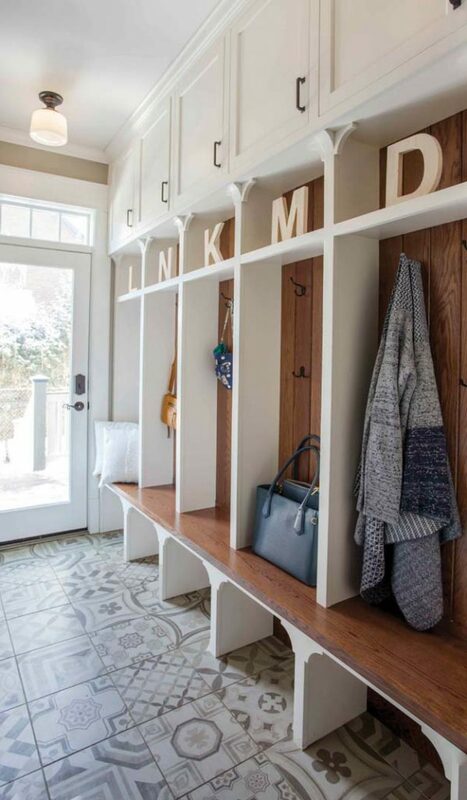 An immaculate white aesthetic with dark wood floors and Dutch Delft tile—complete with deep, white-painted cabinetry, a custom-built library ladder, stainless steel appliances, and a stunning range with ruby red knobs. Designer’s Note: This bustling family of four needed to maximize workspace and increase flow in their 231-square-foot kitchen. Up for a challenge, the designer made subtle adjustments in layout, storage, and aesthetic to produce a practical, yet perfectly functional space—complete with a stunning range hood, crafted light fixtures, gold-toned brass hardware, and a farmhouse-style sink—blended beautifully with loads of natural light and sleek, white-branded finishes. 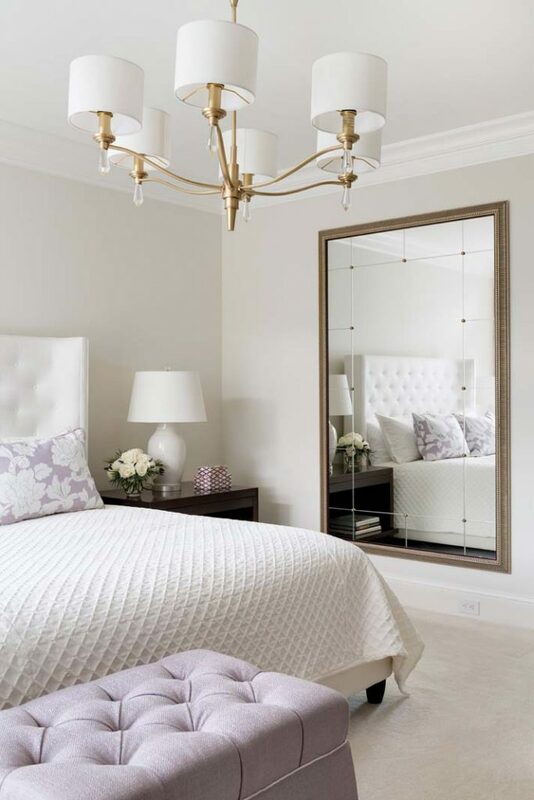 Designer’s Note: With an impeccable sense of style and sophistication, this client needed an elegant bedroom suite to match. The monochromatic color scheme makes her new space serene and soothing, while the lilac and ivory shades produce a warm, inviting energy. 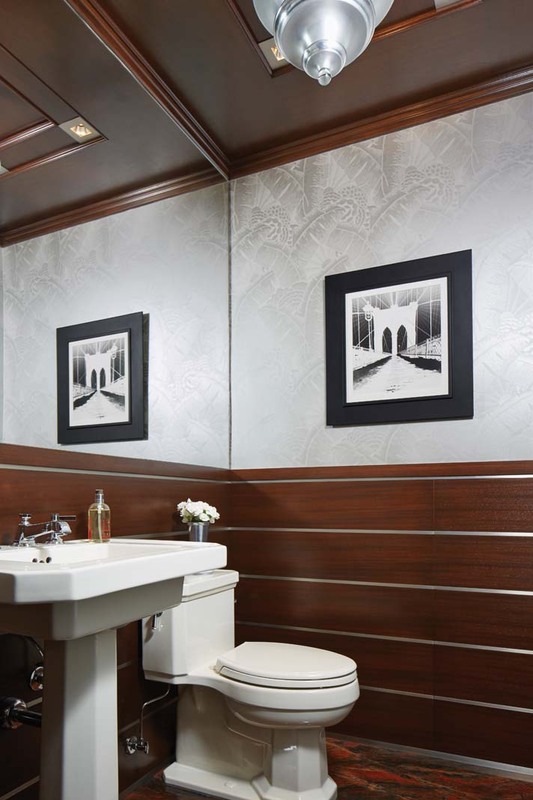 The space is as functional as it is fabulous: Modern, but timeless; classic, but chic; and neutral, but bright; with floor-to-ceiling built-ins, a sparkling bathroom vanity, and delicate details that take this bedroom suite from lackluster to luxurious. 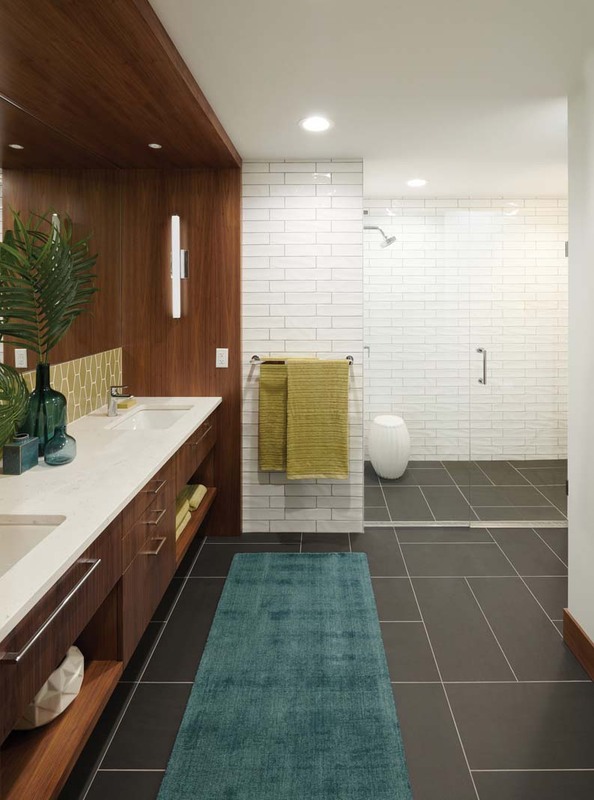 Designer’s Note: The client wanted a brightened master bath with a mid-century modern aesthetic, so the designer removed walls and reconfigured the space to include a walk-in double shower, dual vanity, and built-in linen cabinet. 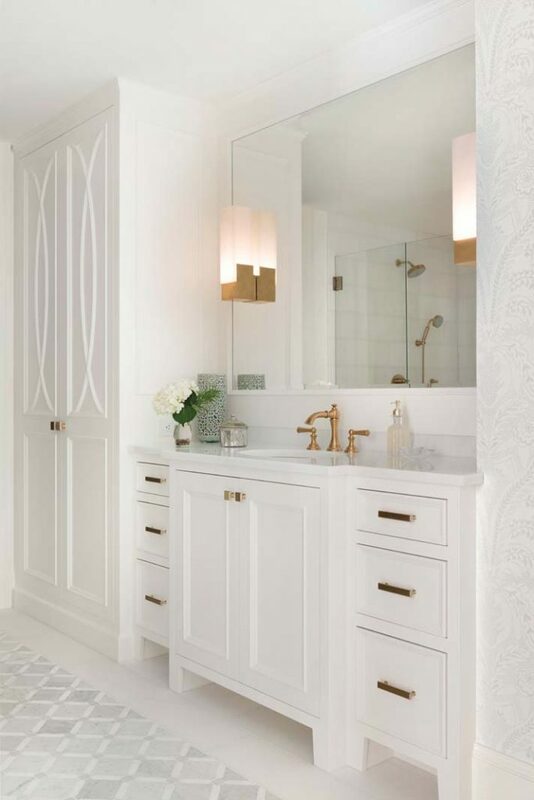 To compensate for the lack of windows and natural light in the room, the color palette was designed to be bright and white, and a sophisticated selection of finishes were layered on top to add color, pattern, and texture. Long hex golden accent tiles were mounted vertically as a focal point to the room, and solid walnut was used for the cabinets to provide rich color contrast. Designer’s Note: After fire and water destroyed this Mediterranean-style revival home, the clients had an ambitious goal of restoring the bathroom to its original aesthetic. 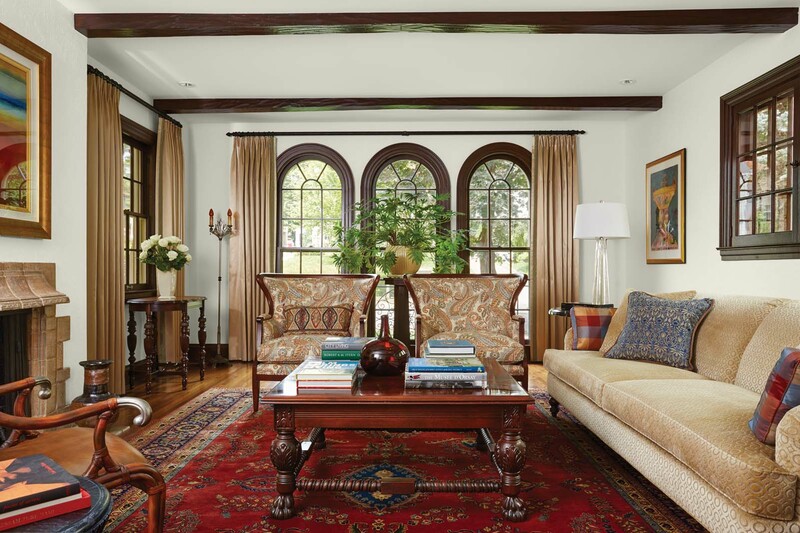 The updated version of this 1928 showstopper features a rich mahogany wainscot, vintage spun-aluminum light fixtures, and flooring made of a dramatic single slab of Red Hollywood granite. 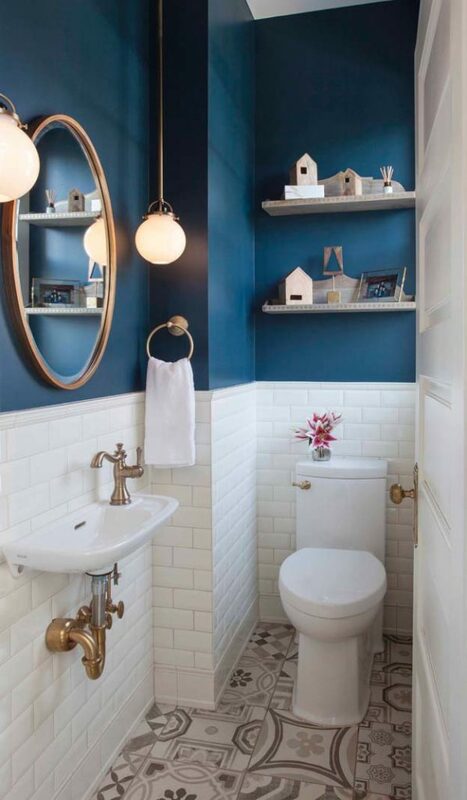 Though complex in construction, this client’s new powder room is clean, simple, and streamlined. Designer’s Note: After the passing of his wife, the client of this ranch-style remodel knew he wanted to honor her in the new design. A large Moroccan rug set the tone for the transformation and ignited inspiration in the form of an Aztec-reminiscent feel, with a wide variety of organic materials and a neutral color palette imbued with texture. Art, sculptures, Argentine dolls, and travel relics are scattered throughout the design—all collected from the couple’s decades of travels together. Designer’s Note: The client of this urban cottage needed a design they loved that simultaneously appealed to a wider audience. 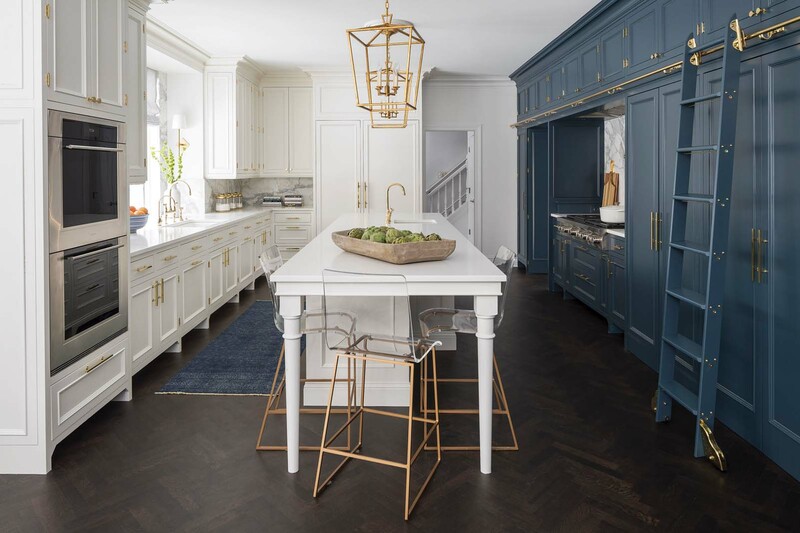 Though the challenge was twofold, the designer succeeded by implementing a white, black, and cool navy theme throughout the impressive layout and combining it with marble-like quartz countertops, gray cabinets, and striking light structures. The aesthetic, design, and modern architecture crafted the ultimate selling point for both audiences: A magical backyard oasis complete with a nine-foot-deep saltwater pool and a cozy, secluded entertainment space. Designer’s Note: After a fire destroyed most of this 1928 Mediterranean Villa-style house, the clients wanted to remain true to the building’s original design while making improvements to outdated areas, such as the kitchen, to better meet the needs of a modern family. 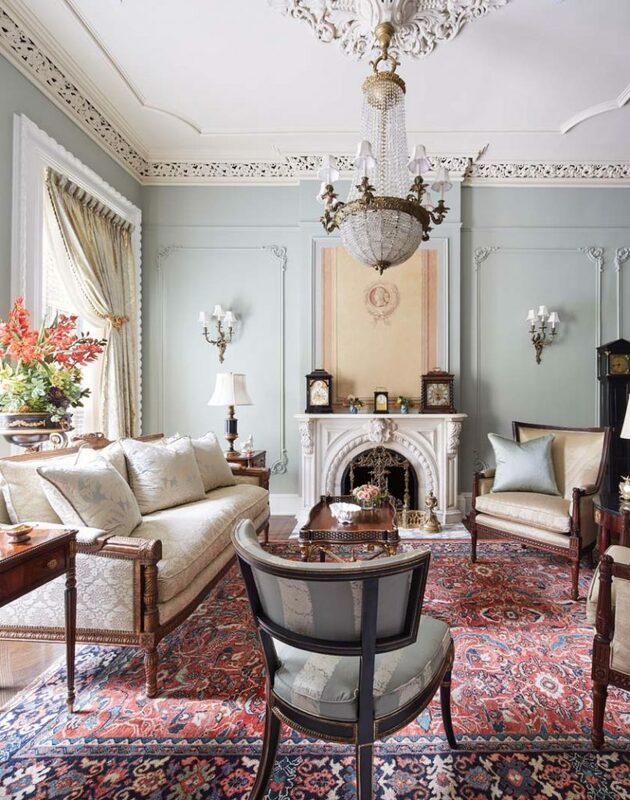 They focused on retaining what furnishings remained, including two restored Baker wingback chairs, rebuilt and reupholstered in fabric similar to what the owner originally had, while incorporating new details to create a home that has truly stood the test of time. 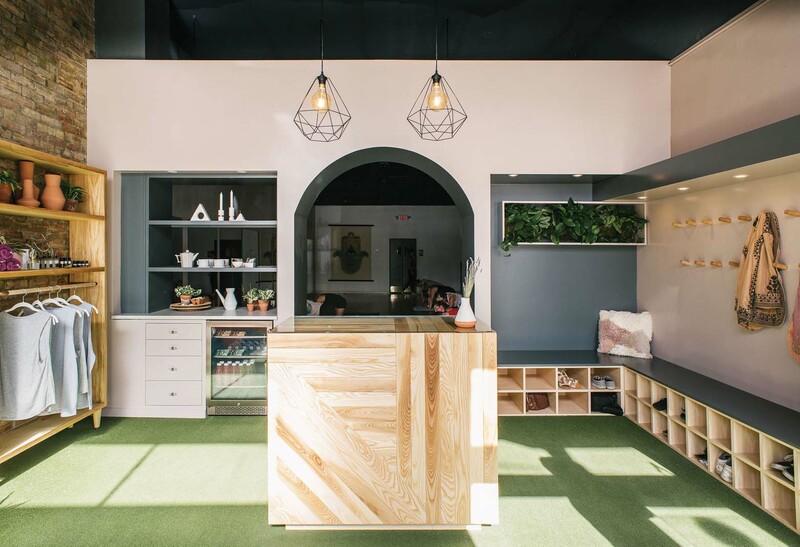 Designer’s Note: When hired to renovate a donation-based yoga studio that had been sustaining itself for five years, the designer’s first priority was to thoroughly understand the studio’s mission. 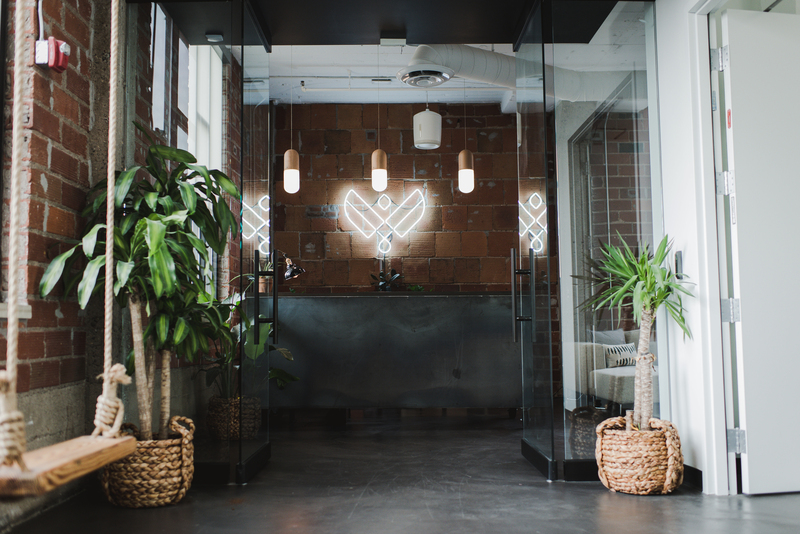 To create an environment that properly complemented the company ethos, she converted what was previously a single long, dark, open space into a light, bright, and multi-functional domain. Seating, merchandise, and beverage station areas were added, and holistic design practices incorporated through plenty of natural light and lush plant life. The new space has a fun bohemian feel and postmodern touch through vibrantly-colored vintage furniture finds and décor pieces. Designer’s Note: Smoky barbecue and smooth spirits trademark this contemporary, southern-style restaurant joint born out of a small, dark, wine bar. 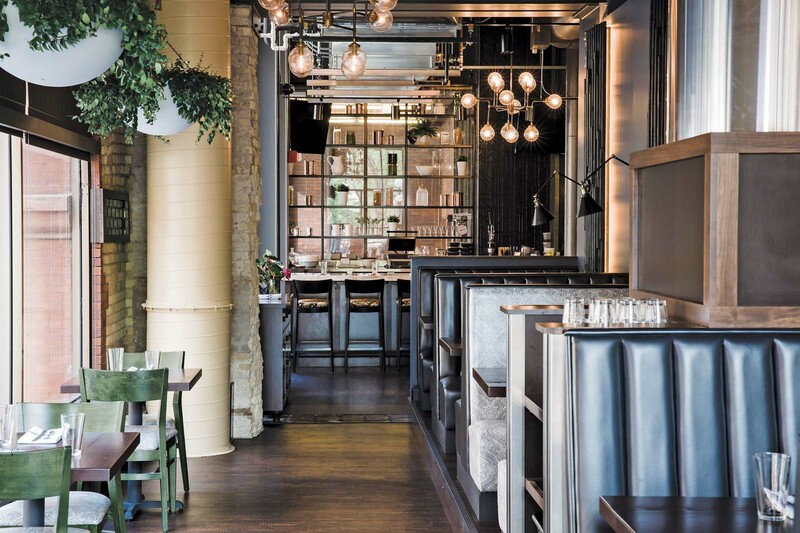 The designer replaced artificial light, tight walls, and an awkward layout with an energetic and flowing interior that boasts exposed brick, arched windows, enticing textures, and custom creations from local artists—including distinctive light fixtures, a copper bar top, and charred wood wall art. 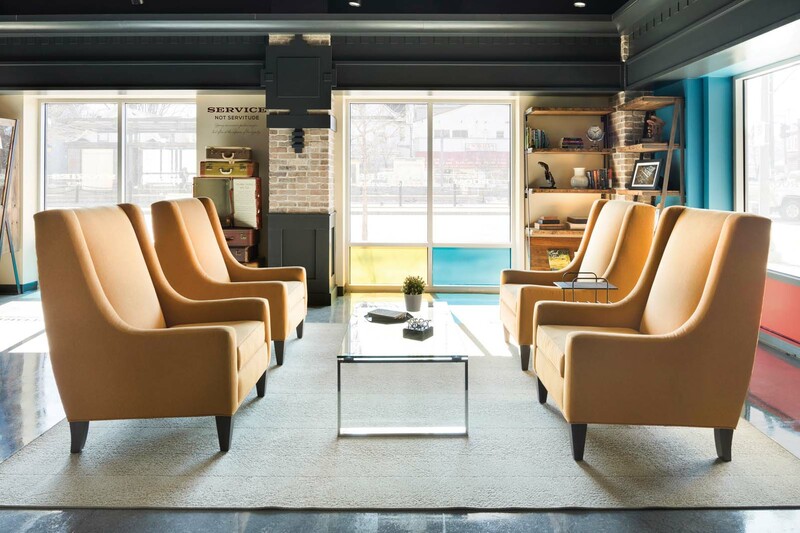 Designer’s Note: As a branding and experience design agency located in the bustling North Loop neighborhood of downtown Minneapolis, a collaborative environment was a must-have for the clients. In response, the designers created an expansive floor plan with unique touchdown spaces including elevated lounge chairs and swings at reception to allow freedom for individuals to choose to work. 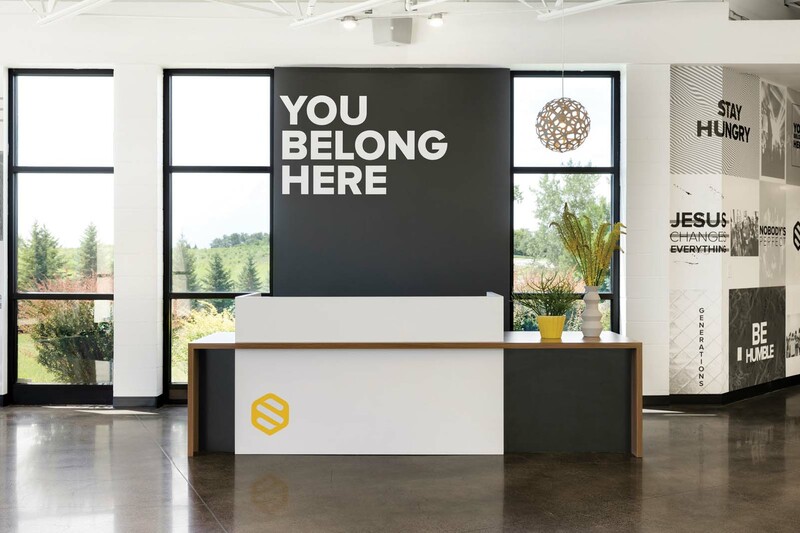 To reflect the company’s authentic spirit, raw materials such as leather and canvas were chosen to enhance the reclaimed wood and concrete flooring of the 5,000-square-foot workspace. 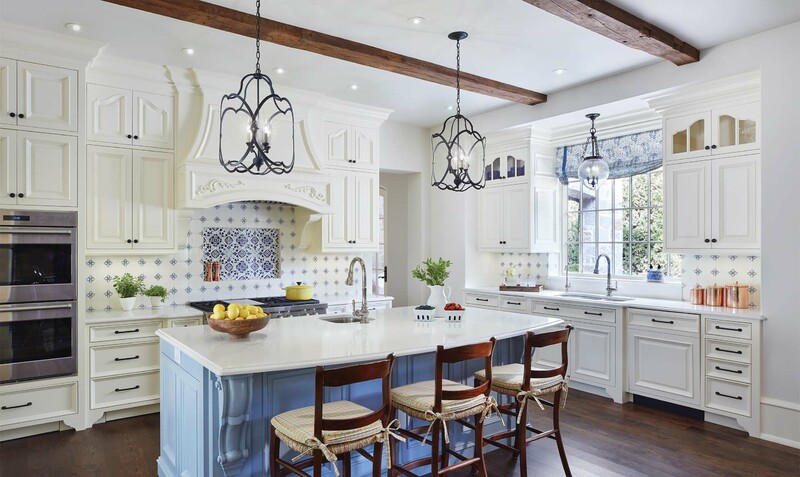 Designer’s Note: The new tented ceiling of this kitchen demanded something particularly spectacular for lighting, so the designer installed a beautiful custom chandelier over the central table that echoed the room’s cherry cabinetry and millwork. 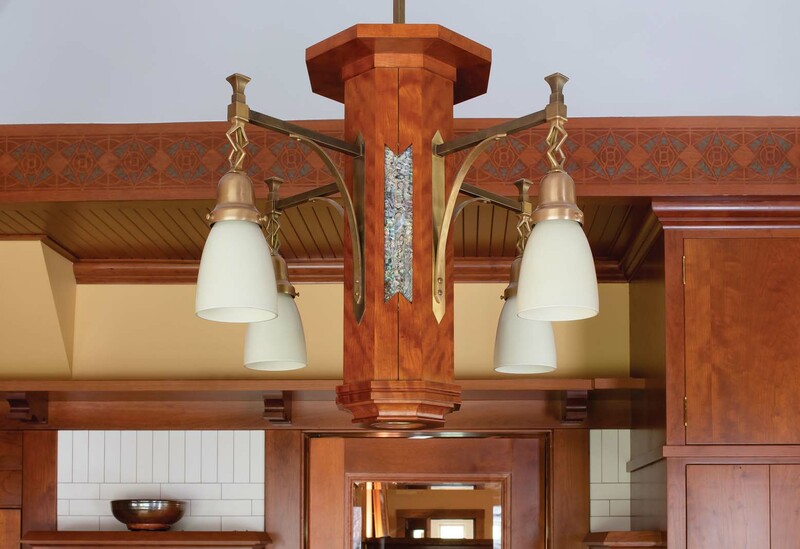 Four blown glass shades provide light, while mother-of-pearl inlays further tie the chandelier to the surrounding cabinetry, and unlacquered brass—found in details in original parts of the house—was selected for the metal brackets and carries through the rest of the lighting and hardware within the kitchen.